Multiple Grade 1 winner Dortmund is back in training at Art Sherman's barn at Los Alamitos, according to a report by The Blood-Horse. Retired in April, the son of Big Brown is expected to put in his first timed workout this summer within the next 30 days. A next start for the colt has not yet been announced. 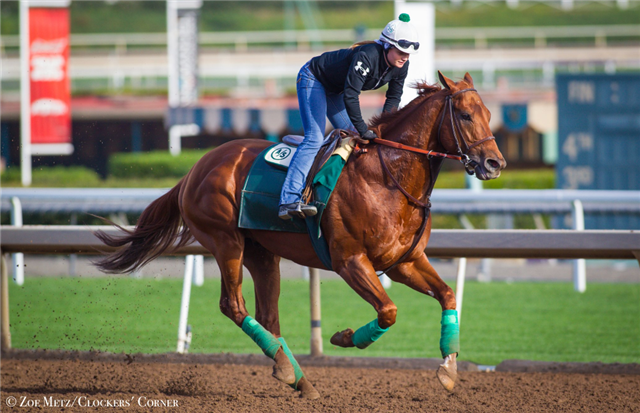 This entry was posted in NL Article, Racing and tagged art sherman, california horse racing, dortmund, horse racing and breeding, kaleem shah, thoroughbred by Paulick Report Staff. Bookmark the permalink.